Ever since making these cookies, I have been dying to make another set of cookies using the flower fondant/clay molds. Not only do they produce some really awesome 3-D decorations, they are just so easy and so much fun to use! 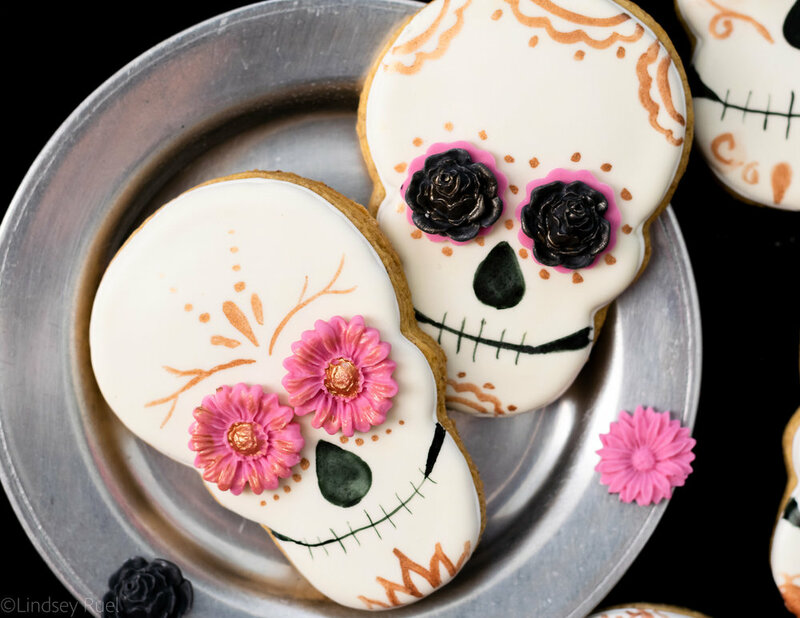 Thank goodness for all the Dia de los Muertos decorations I have been seeing all over the Internet for inspiring these cookies. The fondant flowers are the perfect decoration to add to the eyes of these skulls. Bonus: since they are the star of the show, the rest of the decorations can be kept minimal and simple. For instance, I just added a little gold paint to the foreheads and chin, and that was all that was needed to make these fabulous cookies! For these cookies you will need sugar cookies cut into a skull shape. I picked up my skull cookie cutter at Michael’s years ago. But you can also find it in a Halloween set. You will also need royal icing in flood consistency. I outlined and flooded the entire cookie before moving on to the fondant. Note: your icing will need to be completely dry before adding anything on top. As I mentioned above, the first step which is not shown in the video is to cover the entire cookie with white icing. You can do that by outlining and filling the entire cookie with white icing. Or you can cover the entire cookie with fondant. Once your cookie is covered, you can move on to the fun part: decorating! I mean, these were just so much fun to make! And anyone can do them! Trust me guys, I am not as artistic as you think I am, so if I can make these, you can, too!! You can even have the kiddos help make the flowers with the fondant molds or paint their own designs on the cookies!